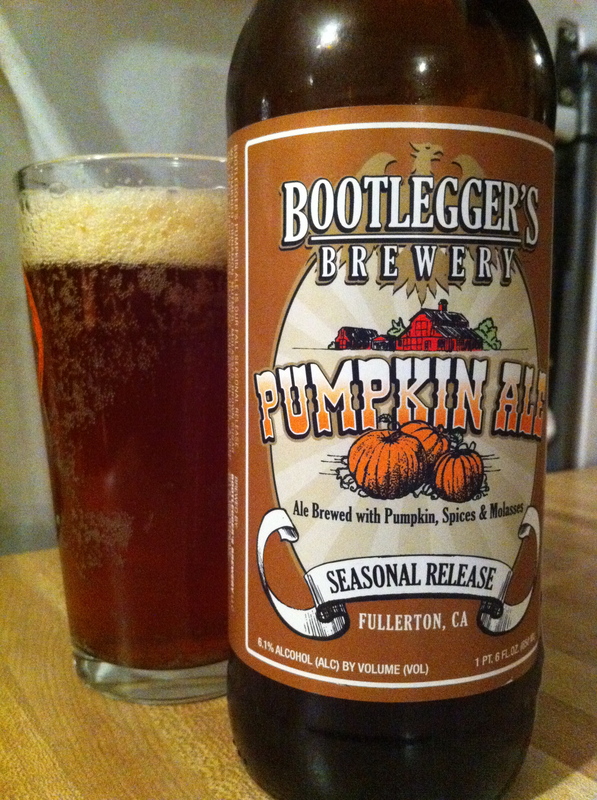 Ever since I went to the Bootlegger’s 3rd Anniversary this past April I’ve become a big fan of their work. Every time I see one of their new beers on the shelf/on tap at a bar I have to give it a try. Their autumn seasonal, PUMPKIN ALE, was no exception. Pumpkin Ale is a pumpkin ale (duh) with 17.8 IBUs and a 6.1% ABV. Pumpkin Ale is our Fall Seasonal Release Beer. Brewed with cinnamon, nutmeg, molasses, brown sugar and real pumpkin juice to create this special beer. A beer that reminds us of coming home to family and getting the fresh pumpkin pies out of the oven. A perfect beer to sit back and relax with while watching the leaves change color in the fall. The first thing I thought of when this caramel brown ale poured into my glass was a yard littered with dead leaves. A murky, bubbly toupe-colored head sits atop the brown, but it fades quickly. Oddly enough I didn’t pick up any pumpkin in the nose. It starts with pie crust, gingerbread and molasses before finishing with a caramel extract like sweetness. The taste is almost exactly the same as the nose. Ginger-dusted pie crust with hints of molasses, with a backend of caramel. Sadly, the taste seems like they’re using extracts instead of real ingredients (I could be wrong). Mouthfeel is medium-to-light. It evaporates quickly leaves a slight stickiness behind.